Portrait of Edmond Belamy, 2018, created by GAN (Generative Adversarial Network), which will be offered at Christie’s in October 2018. This month, Christie’s will become the first auction house to bring a piece of AI (artificial intelligence) art to auction. The work is titled Portrait of Edmond Belamy and it is by the French artist collective Obvious. This story has captured the public’s imagination and has been all over the mainstream media. And what the media have told you… well, it is all wrong. I’ve got to be honest with you, we have totally lost control of how the press talks about us. We are in the middle of a storm and lots of false information is released with our name on it. In fact, we are really depressed about it, because we saw that the whole community of AI art now hates us because of that. At the beginning, we just wanted to create this fun project because we love machine learning… …If I was not part of this and saw the articles that are coming out, I would think it was a scam or not right. How did three friends with no artistic training end up at Christie’s selling their very first piece? Why did Obvious imply that machines were doing all the work in AI art when they knew it wasn’t true? How might this have undercut the rest of the AI art community? Did Obvious simply repurpose ideas and code written by other developers and artists? If so, do artists like Robbie Barrat, whom Obvious borrowed heavily from, deserve a percentage of the credit and perhaps the sale? If not, where is the technical or artistic innovation on the part of Obvious? What does this work going to auction say about our understanding and feelings about AI as a society? Is it worth bidding on this work, and if so, what would I pay? Early on Obvious made the claim that “creativity isn’t only for humans,” implying that the machine is autonomously creating their artwork. While many articles have run with this storyline, one even crediting robots, it is not what most AI artists and AI experts in general believe to be true. Most would say that AI is augmenting artists at the moment and the description in the news is greatly exaggerated. In fact, when pressed, Hugo admitted to me in our interview that this was just “clumsy communication” they made in the beginning when they didn’t think anyone was actually paying attention. Right now it's like a computer program that can do something that we find impressive, but it is not really that impressive in the end, because if you think it's some kind of robot with a human-like mind, okay, it's really, really impressive, but it's not. And we totally understand that the whole community around AI and art took this as a really bad thing, because for them, I think that they feel that what they do is not represented as it is, as they think it is. And now we agree with them, but we can't really convey this message because we are being a bit misrepresented. In addition to completely undercutting their efforts by falsely attributing 100% of the credit for AI art to machines, AI artists are also mad that Obvious stole the spotlight with work that is seen as basic and derivative. 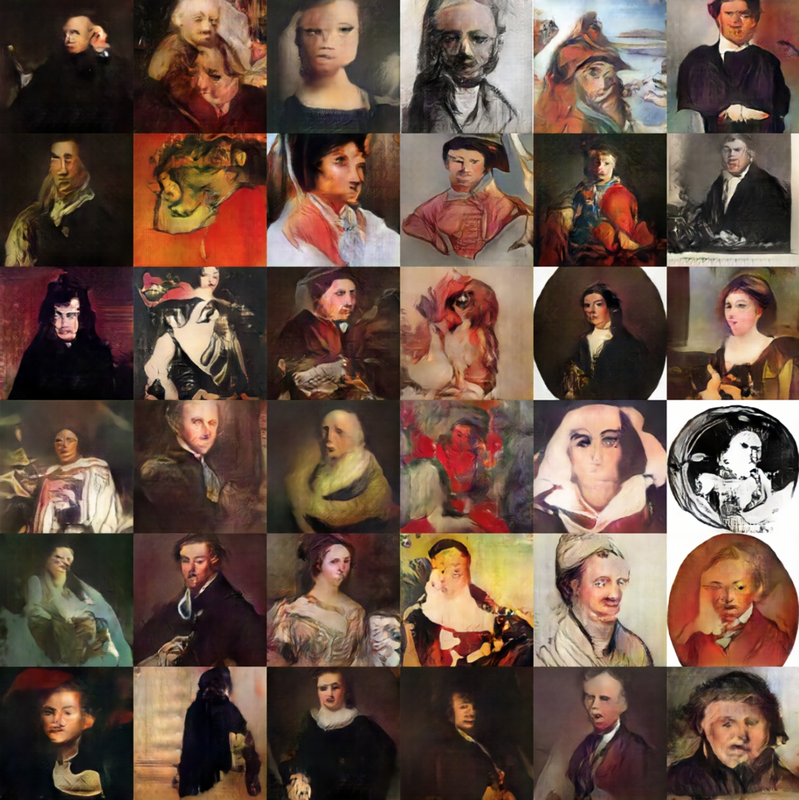 The idea behind the Belamy project borrowed heavily from one of Robbie Barrat’s earlier projects that uses historical portraits to train a GAN to generate AI art. Maybe you are thinking that that’s a pretty broad project idea. Shouldn’t other artists be able to explore that, as well? Sure, but Obvious also admits to using the exact same scraper for getting the portraits from the exact same website, Wikiart. And who wrote the scraper that Obvious used? Robbie Barrat. Where is Obvious’ innovation and creativity? Yeah. I think this is a good question. We ask ourselves this question a lot, too. And we're like, 'Okay, what can we do with this?' But in the end, the fact that what we did is this physical piece, and that we signed it with the formula is something that we wanted to do. I think that has a lot of responsibility in the exposure of our project, too. So we owe him a lot, and that's what we said to him, that we wanted to be up front with him. So we owe him a lot. We wish him success. And we hope that if people like our project, they'll go to his project, too, and check out what he's doing. So we think he deserves something in this whole situation. And then, I considered doing more. What can we really do? For this project, we guessed that the innovation with it is just like since we presented it in such easy, not-subtle way, since it's really easy to comprehend, I think that's what the innovation is. And I guess -- because I don't really know -- but since it has resonated with so many people, is that there must be something here that is different than what was done before. But at first, we wanted to do something original, something unique. But you can't really control what people think of what you are doing. So yeah, maybe the fact that it was really accessible was the key. For me, as a researcher in machine learning, it's really ridiculous to think that because, like, you cannot put a patent on an algorithm because it's part of the general knowledge of humankind, and anybody could call it their own and use it. Some of the comments, we really agree with this. It's like, what we do is not that complicated, or it can be qualified as not really very original compared to what is done in the AI art community, and we totally agree with that because it was just the first project. It's the first project. You've got to start somewhere. And we started there. I wanted to avoid the same mistake other publications have made in over-focusing on Obvious’ perspective simply because they have work going to auction. I asked Robbie Barrat how he felt about someone using his code and having a very similar project end up at auction at Christie’s. I'm glad that a deeper article is being written about this - most other articles published are very shallow and sensationalist, matching the work in question. As for me getting more credit - that doesn't bother me too much. There were people experimenting with GANs years before me (people like Tom White, Mike Tyka, and Mario Klingemann). I'm more concerned about how out of all the really compelling work done by the people in the AI art sphere, this uninspired low-res GAN generation and the marketers behind it are the ones who get the publicity. It's unfair to the actual artists doing real work at this intersection; the ones that are doing more than just plugging a ton of paintings into a pre-packaged algorithm and inkjetting the results. People like Helena Sarin, who sketches by hand and trains neural networks to augment her sketches, or Mario Klingemann, a "neurographer" who uses chains of multiple neural networks to create extremely compelling art, or David Ha, a research scientist and artist who wrote "sketch-RNN," a neural network trained on pen strokes of drawings, that can predict the next pen stroke in a drawing to either draw all by itself or collaboratively with humans. How did Obvious end up at Christie’s? So are Hugo and Obvious horrible monsters out to steal credit from more deserving artists and then clamoring to get Christie’s attention to make a quick buck? I don’t think so. In fact, I actually like Hugo. We have a great deal in common, as we are both very excited about the intersection of art and tech. In particular, Hugo’s passion for machine learning is contagious. So what the heck happened here? What I believe really happened here is three friends made their first project using GANs (the Belamy series), and they admit it is a simple one. As Hugo says, “everyone has to start somewhere.” They used code, project ideas, and algorithms written by other developers and artists because it was a quick and inexpensive way to get started. Most people start by learning from other people’s code (they just typically stop short of selling the results at Christie’s). We were very surprised when Christie's came to us and said, “Okay, we want to auction this.” For us, it was impossible to refuse that because it was such a great opportunity to show this technology to a much larger audience and lots of people, and to present them what I do in my research, and what we are really interested about. So it was a great opportunity. It was a way to put light on this whole community that we love and that we have been following for a long time, that we think deserves lots of attention. Yeah. We think that this community's really great and should have more people knowing about it. What value do we put on Portrait of Edmond Belamy at auction? …I think it is also one of the reasons we got so much exposure, AI art is also revealing what people think about AI, revealing the fear and the misconception about AI. And that's why it also gets so much attention. So in the art spectrum, I would say this is really interesting because this really does show something about this society, and so in this way, I guess AI is a great way reveal the mood of society and what people are thinking right now. So this is really representative of the current atmosphere around AI and around all the misconceptions around it. So I think that's one of the reasons AI art is also interesting, because it goes to show something about the humans of today. Put another way, most of us are simply not yet equipped with the knowledge required to understand AI, never mind something as complex as art created using GANs. AI will only play an increasing role in our lives moving forward, and AI art is already a rich and promising genre, even in its earliest stages. So Portrait of Edmond Belamy will always have an important place in the history of this genre, deserved or not, as the very first piece of AI art auctioned at a major auction house. The press that it has generated is now part of its provenance, and I would be very surprised if Portrait of Edmond Belamy sold for anything less than triple its estimate of €7,000 and €10,000 (approximately $8,100 to $11,600). And even at that price, I believe it would be a steal. As we saw with Salvator Mundi last year and with the Banksy last week, the most prestigious auction houses, like museums, have the ability to elevate art and increase its value by putting it into the spotlight, shaping not only the narrative of the work, but also the narrative of art history. For this reason, while I do not agree with Christie’s choice for the first AI artwork to bring to auction, I am grateful that they have put a spotlight on a genre of art that I love. 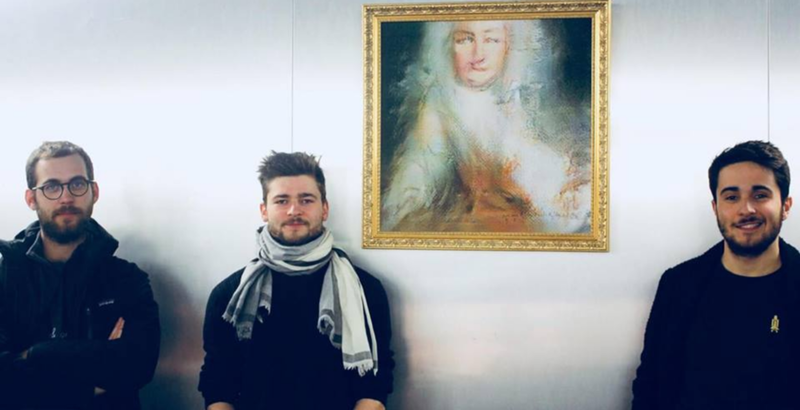 I hope that Hugo is right and this is just the first of many auctions, and the many other deserving pioneers of AI art find their way into museums and private collections. As for Hugo, he is not perfect, nor am I, nor likely are you. But I agree with him that the mainstream media has done us all a disservice by making outlandish claims about AI art and missing the real story behind the first piece of AI art to go to auction. I will publish the full interview with Hugo later this week. I hope you enjoy it.